SuiteCRM image is secure, up-to-date, and pre-configured to work out of the box. SuiteCRM is a completely open source, enterprise-grade Customer Relationship Management (CRM) application. SuiteCRM is a fork of the popular SugarCRM application. 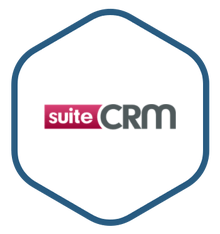 SuiteCRM is a full-featured, free and open source Customer Relationship Management (CRM) platform that was forked from the popular SugarCRM in 2013. It became popular when SugarCRM stopped supporting their open source version, and has a thriving community that has contributed a wide range of new modules and new features. Existing SugarCRM CE users will find a convenient upgrade path to SuiteCRM. SuiteCRM is an enterprise-grade alternative to proprietary CRM platforms, and it has the features that make it powerful enough for large and sophisticated sales organizations. It tracks data and produces intuitive charts and graphs, and automates sales workflows for quotations, contract renewals, and lead follow-up. Its customer portal functions like a help desk, enabling customers to self-service when issues arise. Automate your sales organization with opportunity management, contact management, account management, forecasting, quotes & contracts, and detailed reporting and analytics. Add-ons and modules for additional reporting capability, integration with third party services like ZenDesk and MailChimp, Agile project management, timesheets and invoices, and many more. Every line of SuiteCRM code is free and open source. Existing SugarCRM Community Edition users who are looking for continued development of new features and bugfixes have an easy migration path to SuiteCRM.